During the first quarter of 2017, the foreclosure rate in the St Louis metro area was one in every 487 housing units, a decline of 19.59 percent from the quarter before, and a decline of 3.61 percent from a year ago, according to a report released today by Attom Data. 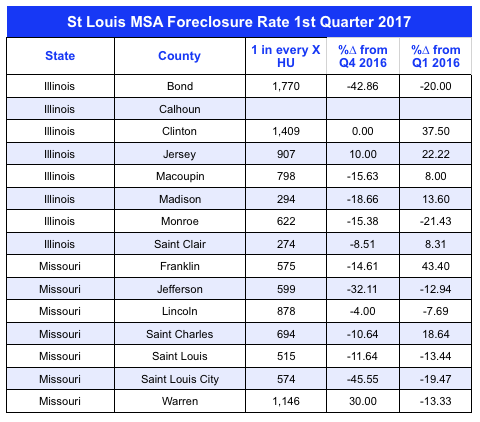 As the table below shows, of the 7 counties in Missouri that are part of the St Louis MSA, 6 saw a decline in foreclosure rate from the quarter before and 5 of the 7 saw a decline from a year ago. The foreclosure rate in St Charles County during the 1st quarter increased 18.64 percent from the 1st quarter of 2016 and Franklin County saw a 43.4 percent increase in the foreclosure rate during the same period.